** WE HAVE ACCEPTED CONTRACT - BUT - APPROX 15 ACRES BEHIND HOME STILL AVAILABLE. CALL LISTING AGENT FOR MORE INFO ! 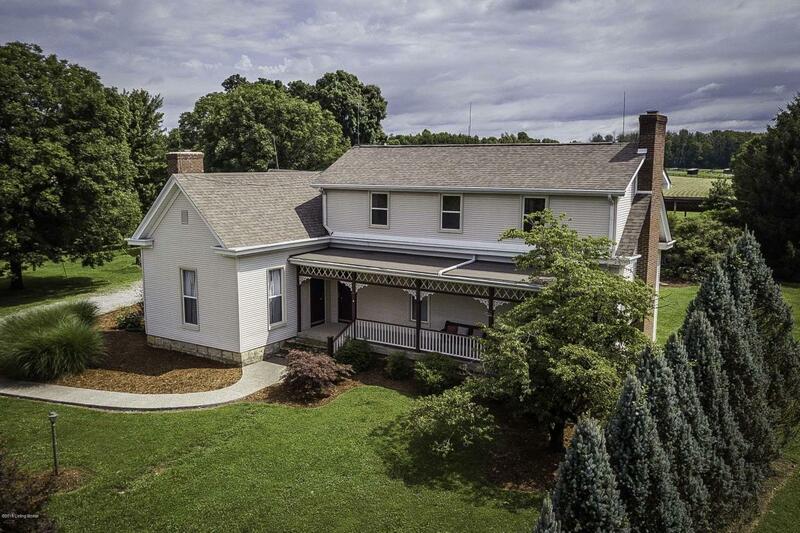 Step back in time when you step into this incredible home whose original history dates back to the 1800's. Take the winding tree lined drive up to this beautiful home that has been meticulously maintained and updated over the years. A brand new (April 2018) sidewalk takes you to the COVERED FRONT PORCH. Step inside to the ORIGINAL PORTION of the home, a gorgeous FOYER with tall ceilings, beautiful moldings, original wood floors and an antique light fixture. To the right of the Foyer is a hallway leading to a FIRST FLOOR MASTER SUITE. Three windows with Plantation blinds let in plenty of natural light, aswell as the pretty French doors. Romantic Fireplace. The pampering Master Bath boasts a dual sink vanity. Flanking the left of the Foyer is another hallway leading to two additional First Floor Bedrooms. (One is presently staged as a large Office/Library. A lovely FIREPLACE (One of three) takes center stage. The Third Bedroom is also on this wing of the home. The Family Room is quite spacious, offering a stunning triple window and a handsome creek stone Fireplace. Off the Family Room is a recently remodeled Full Bath with a tall vanity accented by a Granite Counter Top. The Jetted Tub is truly a beauty, with lovely ceramic tile. The Fully Equipped Kitchen was remodeled in 2010, and is truly a chef's dream kitchen! A wealth of beautiful cabinetry accented by a tile backsplash with stunning inlays, A WOLF 4 Burner Gas Range with a large center griddle, Double Ovens, A Warming Drawer, and a Steam Oven. The home distiller yields distilled drinking water and ice as well as the instant hot water tap at the kitchen sink. Solid surface counter tops with a high counter that doubles as a Breakfast Bar. The very spacious Breakfast Room features a wall of windows overlooking the back yard, and a BRAND NEW DECK and PATIO! The Formal Dining Room is banquet sized ! And so beautiful, with a stunning chandelier. Original wood floors. The owners remodeled the entire SECOND FLOOR with THREE MORE BEDROOMS, hardwood flooring. (Original floors were painted in the "Attic" Bedroom). A Walk In Attic provides great storage. The UNFINISHED BASEMENT/CELLAR also provides plenty of extra storage. OUTDOORS: Enjoy entertaining friends and family ! Fantastic ** 20 x 44 INGROUND POOL ** (Depth is from 3.5' to 8.5' with a Diving Board and has a BRAND NEW LINER (April 2018, Pump is approx 6 years old.) The Covered Entertainment Area beside the pool is a great place to grill out, kick back and relax! This is a PRIME LOCATION with I-71 just minutes away, and both Louisville and Crestwood shopping, restaurants and other amenities nearby. And of course AWARD WINNING Oldham County Schools are close by as well. Plenty of room for a FREE STANDING GARAGE or OUTBUILDING. ALL WINDOWS (with exception of one basement window) NEW in 2012 by WINDOW WORLD. Sellers state that windows come with "All inclusive transferrable lifetime warranty." This is such a beautiful piece of property, serene and peaceful. You will simply love it and want to make it yours!